Detroit is a hole where even a werewolf's sins can be buried. Or so Jake Brennan hopes. Hiding from his hunters, shooting heroin to negate the effect of the full moon, he is beginning to turn things around. And the day he is witness to a brutal attack on ER doctor Gwen Cheevey, Jake is forced to transform into something new: a hero. But when a clip of his good deed goes viral, Jake's days of hiding are over. To keep Gwen safe, Jake will need to embrace the beast within. Is he strong enough to control it, or will Gwen become another black mark against his name? Totally a werewolf guy over vampires and zombies, now that zombies are mainstream. I have recently listened to a few off beat werewolf stories that didn’t quite hit the mark. This one totally did. This was fantastic. Not only is this a unique werewolf story, the plot stands out from most of them. I’ve come across little bits of pieces of this story before but I think this one put them all together with a nice little bow wrapped around. Definitely going to get more from this author. Everything about this plot was perfect, I loved the settings, and really enjoyed Jake as the werewolf, a man torn between his two selves. The story line felt more real than a typical werewolf fantasy story. I found it a little cliché that Jake meets up with Gwen, a Dr. who is able to continually patch him up and send him on his way; but, their interactions seemed real and kept me wanting them to meet again. I liked Gwen, then hated her, wanted to be Jake, then thought maybe not. This provided a lot of excitement. The author really created a great story in an often overly copied genre. Travis Baldree is definitely in my top 5 for narrators. I really love his gritty voice for specific characters and his ability to switch it off for others. He did all the characters amazingly and did the hunters perfectly. He really has a craft for this and I’m trying to get as much of his work as I can. His voice alone made this worthwhile. There are people who knit pick grammar, spelling, pronunciation, junk science, etc. I am a gun guy. I get chills when I hear bad gun things. I heard, “this is a Glock 17. Single stack of 10 9mm rounds in the clip. Less than a standard 17.” I don’t even know what to make of that. I get this was in dialogue so it could have just been the character but I hear this made up stuff so often I had to stop the story and listen to it a few times. It was that classic record scratching halt to everything. Not just a werewolf book! Well this was all sorts of awesome!! It isn't just a werewolf book, it was so much more. So Jake Brennan is a werewolf on the run from hunters and his own demons. He is homeless in Detroit and shooting heroin 3 days a month during the waxing, full and waning moon, to stop his beast from emerging. During the rest of the month, Jake does his best to make amends for what he is. When he witnesses a doctor being dragged towards a van, Jake immediately goes to help. A passerby takes a video of him being a hero and posts it to youtube. The wrong people see the video and once again, Jake is being hunted. But Jake may have an unwitting ally in the doctor he saved. Can he control the beast and save her from the people and things that are hunting him? I wasn't too sure what to expect from this, but it did sound like something I'd love, so I gave it a go. And boy was I happy I did!! I adored Jake!!! His journey to where he is now was hard, and he feels the need to atone for the people he has killed while in wolf form. He is trying to keep the beast at bay with drugs, but sometimes he doesn't have the money for them and his beast gets free. He is raked with guilt and doesn't form relationships easily. But when he saves the doctors life, and then saves a little girls life, he realises that he may need some help from the doctor. She can prescribe him things to keep him safe!! Jake is a deeply flawed man, but he is always trying to do the right thing, and I loved that! I loved seeing him fight his beast and not give into the bad, which always seems easier to do. He held onto what his mother taught him and tried to live the right way as best he could. I also loved Gwen. She is an ER doctor and unhappy with it. She swore an oath to do no harm but she feels that being an ER doctor isn't for her. She doesn't feel like she is making a difference. But it's when she is nearly abducted that she knows for sure that this isn't for her. Meeting Jake is also something that makes up her mind. She sees that he is homeless and that he is a junkie, and feels that maybe she can make a difference in his life. Maybe she can help him get clean, but she has no idea what she is letting herself in for. Her life is about to change forever!! This is a fast paced, dark and amazing read. It's bloody, it's captivating and it's brilliant!! Seriously, I loved this!! I loved the characters and I loved the story. I even loved the ending because it fitted who Jake was! Go give this a go, you won't be sorry!! Travis Baldree absolutely nailed the performance!! He gave me chills with the way he did the beast!!! His inflections were brilliant and it really brought the book alive. I was seriously impressed with everything!! I absolutely loved this book! From the very top to the final word I was completely enthralled, I couldn't put this book down. 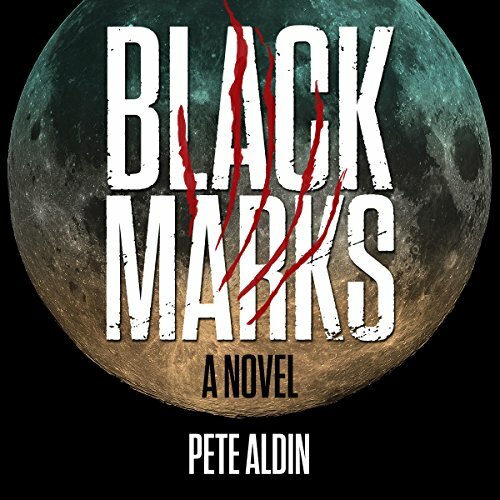 Pete Aldin weaves a superb tale about Jake, a man who has no choice but to engage in a battle with his other self once a month around the time of the full moon. I wouldn't normally gravitate towards a werewolf book but this is easily the best 'creature' story I've read in a while. When Jake meets Gwen, everything changes. He finally has a reason not to flee, a purpose beyond trying to right his past perceived wrongs. Gwen and Jake engage in a roller coaster relationship that is made difficult by Jake's.... condition. I won't say more for fear of spoilers, but I will say that Travis Baldree might be the best narrator I've ever had the privilege of listening to. His voice acting in &quot;Black Marks&quot; is out-of-this-world, it far exceeds the excellent performances of the old timey radio shows but seems similar in style. I would listen to anything narrated by Travis Baldree! I would recommend this story to anyone who enjoys horror/paranormal/creature content. This was a fantastic story that kept my attention all the way through. Great story and perfect narration! This was a pretty good werewolf story. I enjoyed the character development of Jake as he deals with being a werewolf. His methods are very different from other books I've read/listened to with a character fighting what they are. Anyway, this was a very well narrated and enjoyable book. I'd definitely recommend it. Black Marks turns the typical werewolf thriller on it’s head. The story follows the haunted main character Jake, as he tries to control the beast inside of him - trying to right his past wrongs, get his karma in balance. Of course karma has other plans. Nothing seems to go right for Jake. Nothing. No matter what he does or how hard he tries. He saves a young doctor named Gwen, and thinks that it will be points toward the positive, for the good. But it only complicates his life, derails it. He starts caring for her, thinking he has to protect her. It’s a great ride. The action and suspense is fantastic. I was a captive audience, waiting with baited breath to see if Jake was going to be able to come out of this unscathed and with minimum collateral damage. This is another great listen by the narration talents of Travis Baldree. His handling of Jake was superb, as was his acting of the beast inside Jake as it tried to influence its host. I absolutely loved it. Highly recommended. I don't often read books where the werewolf has no control over both transformations and their actions while transformed, so this was a change of pace for me. The different aspects of the story worked really well together, there was lots going on and the overall seriousness of the book was offset by humorous moments. The characters are well developed and their interactions are realistic (ignoring the werewolf aspect). The writing is well done and enjoyable and it made connecting with the story easy. I enjoyed the character voices and the overall delivery was smooth and natural. I thought the narrator did an excellent job of conveying the tone of the book. I totally enjoyed this story. It will hold you all the way through until the end. Great characters and storyline. I really enjoyed this book. It was hard to put down/stop listening. This book surprised me with its character development and how I was rooting for the main character. Black marks was a book that we all could learn a few lessons from. Great listen, great narrator, great book!! I was given this free review copy audiobook at my request and have voluntarily left this review. Can’t wait to read more by this author. A horror story with love. I was freely given this audiobook for an unbiased review. Well written and well told. This is not your normal werewolf tale but a gripping novel of survival and courage. I had difficulty putting this one down. He wanted to be good like his mother said he was, not a bad man, like his father. But for Jake, for 3 nights every month at the time of the full moon, unless he is able to anesthetize himself completely, he will wake up, naked, sometimes bloody, not knowing where he has been. Because Jake is a werewolf. And the animal inside him wants to come out. Very much not the usual werewolf story: no running with the pack, no delight in the power of the freedom. No, the reader travels with a troubled soul whose life is blighted with being what he is, of terrible 'memories' forgotten but still imagined and the inner conflicting voice which constantly argues for him to give in and be something he fears and hates. This is a story of struggle against the odds, of how things can be made possible by sheer determination. A metaphor. The ending is unexpected, but good. Travis Baldree reads well, his slightly sinister voice for Jake encompassing his hopeless desperatkon, his desire to be other than what he is. The narration increases the power of this story as well as giving Jake and the other protagonists voice. I received a complimentary copy of Black Marks, at my request, from the rights holder, via Audiobook Boom - thank you - and this brief review is given voluntarily, an attempt to share my feelings about it. There is action, plenty of it, but much is of the inner kind as well as external confrontation. And there is also love, but not just of the romantic kind. A constant swirl of thoughts and emotions of an ordinary man caught in an exceptional circumstance trying his best to do what he can to be 'good'. An unusual book, very well worth reading. I will be watching for the author's other works.